Frankly, it’s difficult to maintain healthy metabolism with busy lives and poor food habits. In these days many of us plump for restaurants for the yummy fast food dishes. But do you know this is the main reason for the slow metabolic rate? Also, it’s critical to stay healthy and fast metabolism. Don’t think that starving and eating less food will boost your metabolism. Which foods boost metabolism? To know the answer to this question, go through the whole article for the best metabolism boosting foods. Metabolism is the process of all chemical reactions that happen in our body to convert the food we eat into energy. A faster metabolism helps to lose pounds, burns fat even you are taking rest. The basal metabolic rate(BMR) helps all natural functions that performed in our body daily. But several factors affects this metabolism rate like genetics, age, diet, body composition. Do you know what happens if the metabolic rate decline? A slow metabolism will lead to weight gain, high cholesterol, fatigue, depression, slow heart rate, heavy menstrual discharge, etc. The main key for fast metabolism is proper nutrition. Hence, intake of high nutrients, carbohydrates rich foods can help to boost metabolism. In fact, you have no need to follow weight loss methods if you have a fast metabolism. It’s true that our metabolism is ruled by genetics. But we can rev it up by eating certain foods that help to boost metabolism fast. 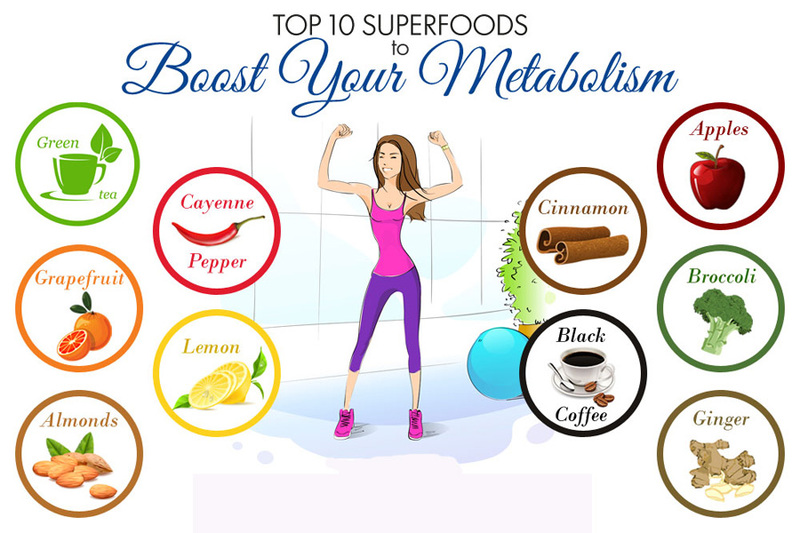 Hence, making several experiments we gave a list of best metabolism boosting foods which can also burn fat. Green tea is one of the lists of foods that boost metabolism. 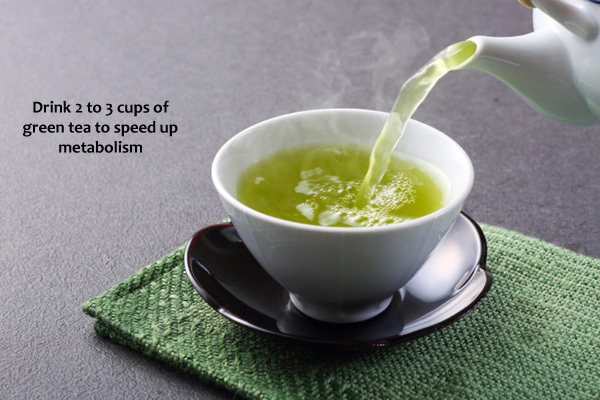 Since green tea packed with antioxidants, polyphenols, it increases metabolism fast. In green tea, antioxidants present in the form of caffeine and catechins will boost metabolism. The secret ingredient ECGC(Epigallocatechin gallate) present in Green Tea helps in the fat-burning process. Studies prove that it is an excellent solution for weight reduction and weight maintenance. Hence, rather going for weight loss pills, better to take green tea daily which also helps to boost metabolic rate. Due to all these health benefits, green tea ranks high among fat burning metabolism boosting foods. But how much amount of green tea should I take daily? Sipping 3 to 5 cups of green tea can help to boost metabolism activities. Hot pepper is the best food to boost metabolism fastly. We have plenty of spicy peppers like Jalapenos, Chillies, cayenne pepper, habanero that can act like metabolism boosting foods. Often any spicy peppers that you choose can have a positive impact on metabolic rate. These hot peppers contain the compound called capsaicin may activate hormones which in turn increases heart rate. Also, makes you breathe fast and help to burn more calories for weight loss. In addition to this, capsaicin can increase thermogenesis that helps to boost metabolism and enhance breakdown of fat. Cayenne pepper has more benefits mainly in three areas like reduced appetite, increased lipid oxidation and increased energy expenditure. Consuming spicy diet can boost your metabolism upto 25%. One good idea is to include these spicy peppers in your curry, soup, sauce, and marinade. Grapefruit is one among top foods that boost your metabolism and burn fat. 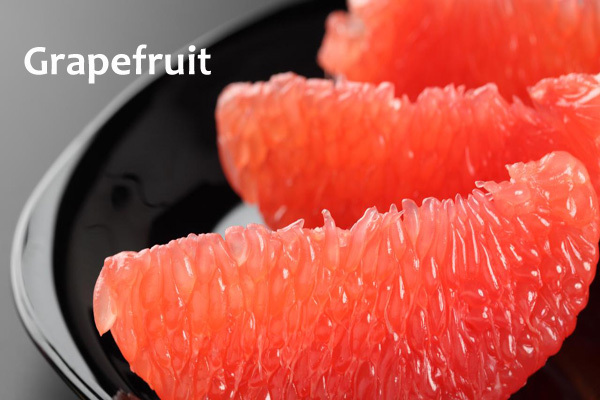 The boosting ingredient in grapefruit is Vitamin C which can improve metabolic system quickly. Also, vitamin c makes you healthy and promotes the immune system to work properly. Grapefruits also consist some other compounds like flavonoids, naringenin which has antioxidant properties required for metabolism. Naringenin controls insulin levels to maintain balance in sugar level and also helps in boosting metabolism. Consuming half a grapefruit contain 38.4 milligrams of vitamin c needed for your daily allowance. Hence, take grapefruit along with your low-calorie diet. You may also consume grapefruit juice for quick weight loss and metabolism boosting. It’s surprising that small size portions of almonds show a significant effect in boosting metabolism. Some people think that taking almonds can cause weight gain. But it is false, even almonds are high in calories, it gives energy rather than fats. Often, they help to increase body’s energy expenditure. Almonds are a rich source of Vitamin E, proteins, and fibers. Hence, consumption of almonds can aid to burn more calories and leads to weight loss. Since almonds are packed with omega-3 fatty acids, they act as metabolism boosters. But do not eat almonds in excessive quantities, just handful of soaked almonds is enough for a day to lower cholesterol levels. Besides almonds, you can also consume tree nuts, walnuts, and other whole grains as a snack for healthy metabolism. Without water, the superfoods list is incomplete. If you are dehydrated, it can slow down metabolism. Whether you choose low fat, low cholesterol foods the main thing you should do certainly is drinking lots of water. Several weight loss programs suggest that consumption of water can help to burn calories. Even if you choose many weight loss foods, it doesn’t show any impact if you don’t consume water. Often, studies prove that drinking 8 glasses of water can help to boost your metabolism for about 50 calories per day. Besides water, you can also drink lemon water. The thermogenic properties of lemon can help to break down fats which in turn you can reduce your weight. In fact, lemon helps to detoxify and clears toxins which can improve the digestive system. Hence, lemon is also one of the drinks that boost metabolism. The powerhouse of all green leafy vegetables is spinach. This veggie contains calcium and all essential nutrients required to speed up metabolism. Spinach increases metabolism and helps to burn calories to enhance weight loss. Folate present in this type of green leaf is essential for women’s health. Make a habit of having spinach more times to protect yourself against heart disease, colon cancer, arthritis, osteoporosis diseases. 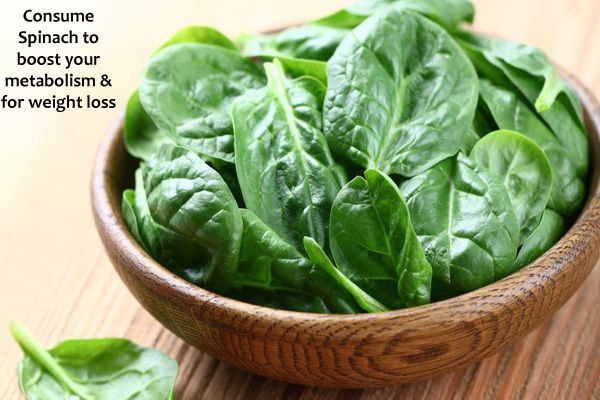 Besides to all these benefits, eating spinach can help to reduce oxidative stress by protecting the brain. Also, it helps to prevent age-related effects in brain functions. Best breakfast is the key to good metabolism. Hence, think boiled eggs for breakfast which provides necessary proteins for a healthy body. Eggs contain the nine essential amino acids required for building muscle tissues strong. Also, they contain omega-3 fatty acids, calcium, vitamin B that needs for best metabolism fast. Chromium, the mineral found in eggs helps to maintain blood sugar stable than other breakfasts. The eggs help for a proper digestive system and reduce constipation. One large egg contains 6 grams of proteins needed for a healthy body. Boiled eggs are a part of a balanced diet to increase metabolism fastly. Hence, consume this food that speed up your metabolism. So, have eggs either in boiled form or omelets. You can also add some green veggies, cayenne pepper for yummy taste while cooking omelets. Anytime we hear that Broccoli is the top among metabolism boosting foods. Often, it is the best food that speed up metabolism for weight loss. But why? Broccoli is rich in calcium, vitamin C components that are necessary to boost metabolic rate. Moreover, broccoli is packed with phytochemicals that help to break down fats. Having omega-3 fatty acids, folate, fibers, vitamins can assist to burn calories without adding extra fats. 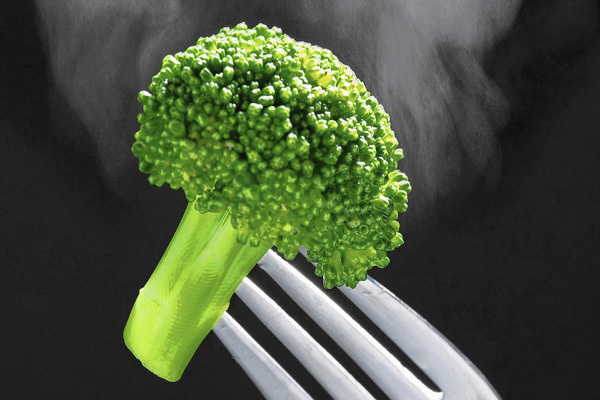 Hence, add 1 cup of either raw or cooked broccoli to your daily diet for increasing metabolism and enhancing weight loss. The most delicious way to speed up metabolism rate is eating cinnamon. Cinnamon contains the metabolic booster called Methylhydroxy chalcone polymer. This polymer promotes an increase in glucose quantities in the body. Type A procyanidins, a flavonoid present in cinnamon controls insulin levels and transports glucose to all cells in our body. Also, this natural blood sugar controller can enhance synthesis of glycogen levels. The thermogenic properties of cinnamon can burn calories and promote weight loss. One tablespoon of cinnamon contains 4 grams of fiber. Experts suggest that sneaking 1 to 3 grams of cinnamon can boost your metabolism and helps in quick weight loss. Deficiency in proteins and minerals can slow down metabolism. So, what are the foods that boost metabolism fat?One of the best foods to increase your metabolism is eating foods that are rich in proteins. One such food that high in proteins is lean meat. You can build muscle mass instead of fat mass in our body when you have meat. Moreover, having muscle mass is best for the faster metabolism. Also, chicken breast and turkey breast are the good sources for proteins. So, lean meat is one of the best metabolism boosting foods. Hence, serve iron rich foods like chicken or fortified cereals for fast metabolism. For people with meatless dishes, choose legumes like lentils, black beans to gain proteins as equal to meat dishes. In conclusion, it’s not hard to replace metabolism boosting foods in place of your daily diet. Making this little replacement can lead to a drastic change in your lives. Hence, follow these simple tips to boost your metabolism and weight loss. But don’t expect one day or week results because it takes time. So, don’t give up and follow these foods and drinks that speed up metabolism and burns fat.